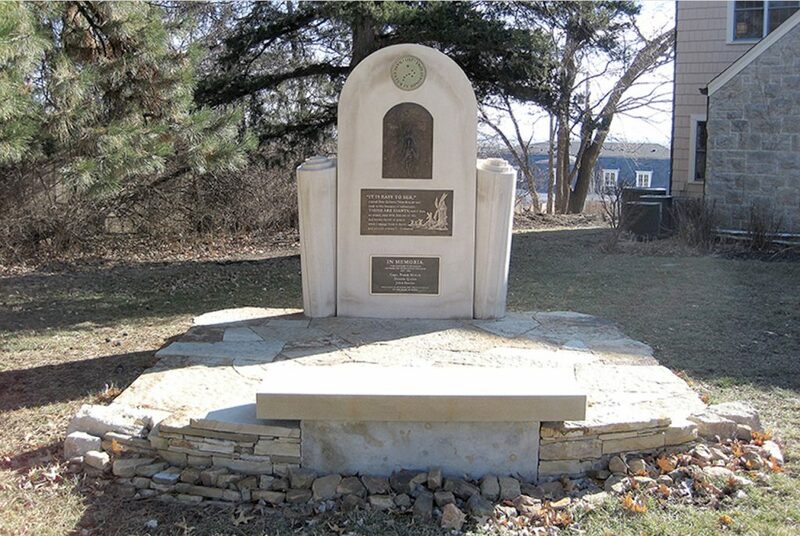 The Pearson Integrated Humanities Program at the University of Kansas has been memorialized with a monument on the grounds of the St. Lawrence Catholic Campus Center. LAWRENCE — It began as a college-within-a-college, a place for “the instilling of wonder and pursuit of truth” for underclassmen. Nearly 40 years after it was formally disbanded, the Pearson Integrated Humanities Program at the University of Kansas has been memorialized with a monument on the grounds of the St. Lawrence Catholic Campus Center here. Founded in 1971 with a grant from the National Endowment for the Humanities by three professors — Dr. Dennis Quinn, Dr. Frank Nelick and Dr. John Senior — the program was designed as a four-semester sequence of six credit hour courses for freshmen and sophomores attending KU. Much of the focus was on reading the “Great Books,” although students also studied theology and were encouraged to stargaze and appreciate the beauty of poetry through memorization. Bloch said the timing of the program, beginning just as the turbulent 1960s had come to an end, was key to its importance. Terry Sercer, a CPA in Fort Scott, is also an alumnus of the program. Both he and Bloch met their future wives in the program. In Sercer’s case, it was Monica Quinn, the daughter of one of the co-founders. Iconographer Peggy Shopen, a resident of Lawrence, was a key figure in fundraising for the memorial as a means of “honoring three men who meant so much to us,” she said. She is also organizing a dedication to be held in September. Among the distinguished alumni of the Pearson Integrated Humanities Program are: Archbishop Paul Coakley, of the Archdiocese of Oklahoma City; Bishop James Conley, of the Diocese of Lincoln, Nebraska; Dr. Robert Carlson, co-founder and first academic dean of Wyoming Catholic College in Lander, Wyoming; and Dom Philip Anderson, abbot of Our Lady of Clear Creek Abbey in Hulbert, Oklahoma.